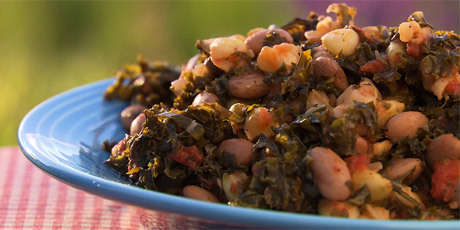 This dish is also referred to as Kenyan Githeri. Githeri (pronounced Guh-theory) is a simple, nourishing staple dish found throughout Kenya. We served it at the Village Feast so our guests could taste the food prepared in the cookhouses sponsored by the event in Kenya. The combination of beans and corn supplies a full complement of protein for the often protein-poor diet of many Kenyans. It is traditionally made with maize but with the help of our friend McKenna we’ve adapted it for western kitchens by using fresh corn. The results are delicious! 1. Cut the corn kernels from the cobs and set aside. Heat the vegetable oil in a large pot and sauté the onions and garlic over medium heat until they are lightly cooked, about 3 minutes or so. Add the curry powder and cook for another minute or so. 2. Add the kale and reduce the heat to low. Cook, stirring with a wooden spoon until the kale softens, about 10 minutes or so. Add the tomatoes, corn and beans and simmer another 10 minutes or so. Add the reserved tomato juice and continue cooking until heated through. Season to your taste with salt and pepper then serve and share! 3. Freestyle variation > Feel free to personalize your githeri by adding a few teaspoons of your favorite dried herb such as oregano, thyme or sage.